This article was recently in the February 2018 edition of our Spark e-newsletter. MCS Advertising not only takes care of businesses and clients in the surrounding area, but MCS works with worldwide international accounts as well. 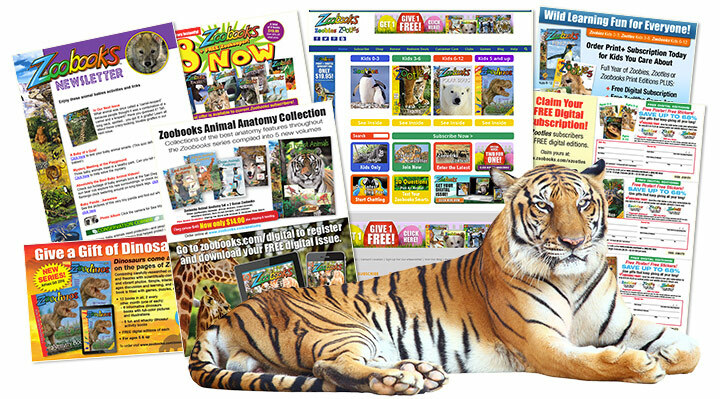 For over 10 years, we have been working with Zoobooks and National Wildlife Federation to promote their publications and products for kids through both print and digital marketing. Zoobooks is one of the most significant wildlife publishing brands in the United States and the world. Their award-winning magazines include Zoobies, Zootles, Zoobooks and Zoodinos. These publications and digital apps are perfect for young animal lovers of all ages. Working closely with the Zoobooks marketing and editorial departments to design and produce advertising and marketing pieces, MCS designs a variety of printed products for them, such as magazine ads, forms, bind-in cards, blow-in cards, buckslips, issue wrappers, direct mail marketing packages, stickers, posters, and more. We also design and produce digital marketing strategies, such as web ads, animated banner ads, redirects, landing pages, digital offers, and order forms. MCS also assists with maintaining and updating the Zoobooks website, which includes creating fun and interesting activity pages each month. Need a solution to grow your business? We have extensive experience in the marketing realm and can assist you with all of your marketing needs. MCS is your full-service print and digital agency.